I actually heard that twice this morning from co-workers. It didn’t relate to finances at all — it was a desk relocation type of thing and a vacation request. Anyway, touching on yesterday’s post, well, “it” is fair. It’s totally fair. Over the past few months, just by observing other people, it has become a lot more obvious to me that life is pretty much fair. Most people just don’t seem to get it. They’re on cruise control in life and think that it’s unfair when things don’t just fall in their lap. That you never stop learning and growing. That you DECIDE what you want, with precision. You can’t be vague. I want to be rich or I want a sports car doesn’t cut it. That you focus upon what you want, visit your goals often, and track your progress. Think and act in accordance with the above, weighing even the smallest decisions against how they help you learn, grow, and/or get what you want. These are EXTREMELY powerful requirements — and here’s the catch: you can’t miss a single one… For me anyway. Too many people want to float through life and have good things fall out of the sky upon them. People get ahead by trying to get ahead. By working to get ahead. I challenge one co-worker, who’s thrown in the towel and stopped their 401k contributions entirely, all the time to try this for just 30 days and tell me they haven’t made progress towards building a better life. Do it for a year and you won’t be the same person — your habits will totally change. You’ll be happier. Do it for five years and you’ll be destined to realize most of your dreams. Guaranteed. I know I’m on that road myself. But they just don’t get it. To them, it’s unfair. Took a few days off from blogging. Seems this month isn’t going as well as I would have liked — no concrete numbers or anything, but my checking balance isn’t allowing me to attack my credit card balances the way I’d like. Such is life, right? But that brings me to the real subject of this posting. That’s life. And you know what? Life is fair. I’ve found that life is ultimately fair for the most part because it’s pretty much a cause/effect type of thing. There are consequences to actions. Just this month, I can’t attack my balances the way I’d like in part due to the fact that I splurged on some hockey jerseys earlier in the month. Dumb. 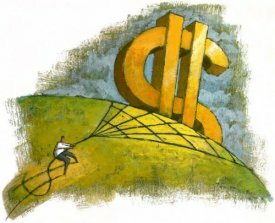 Hazzard over at “Everybody Loves your Money” made a great posting last night — I suggest you read it. I’d have to agree with nearly everything he says. Earlier this week, J.D. over at Get Rich Slowly had an entry regarding his efforts over the past year to curb his addiction to collecting comic books and it’s something I could relate to. While comic books aren’t exactly my thing (I can honestly say I’ve never read one), I too have a collection that at one point turned into an addiction and cost me a lot of money along the way. My vice is “used” clothing. No, no, it’s not some gross perverted thing. It’s not like that at all. Specifically, I collect game used hockey jerseys. And believe it or not, they’re very expensive. My collection currently stands at over 200. Among the collecting community (and, yes, there is one), that’s a pretty large collection. Not the biggest, but it’s right up there. I’d have to estimate that I’ve spend in excess of $75k over the years growing the collection. Yes, that would buy a lot of comic books! Over the past few years, I’ve taken a step back while I’ve become much more aware of where my money is going. I’ll no longer use a credit card to buy a jersey. In 2002 alone, I spent a whopping $14k on hockey jerseys. That averaged out to well over a grand per month — FOR USED SHIRTS?! This year has been my best ever, I’ve done my best to limit myself to one jersey per month and a top price tag of $200. I know, that sounds like a lot, but you have to think there are people out there shelling out that kind of money for a baseball card. Here, I’m getting the actual shirt the player wore in competition. That’s a lot cooler than a piece of cardboard in my opinion. In the past, I had no ceiling. If I saw a Ron Francis Hartford Whalers jersey on the market for under $5k — it was destined for my closet. Those days are over. Anyway, J.D. lists 10 Ways to Curb the Habit. Many of them, I’ve done in my own effort to cut the spending, others, well, they need some work. 1. Reduce exposure to hobby news. Unsubscribe from magazines and RSS feeds. Delete bookmarks. Try not to talk about your hobby with other collectors. The more attention you pay to your collection, the more you’ll want to spend money on it. This…I have done. I used to get automatic updates from eBay whenever a jersey from a specific team was listed for sale. That’s a thing of the past. I also deleted bookmarks to dealer sites and the two big message boards in the hobby from my home and work computer. That isn’t to say I don’t visit gameworn.net (the better of the two) semi-regularly still, but it’s not as often as it once was. 2. Don’t be a completist. Collect what you like and will use, but don’t feel compelled to collect everything. For example, Marvel Comics publishes its Essentials series of comics compilations. It’s okay for me to purchase Essential Spider-Man — I’ll read that repeatedly and enjoy it. But why did I buy Essential Ghost Rider, a book I will never read? I only bought it to have the complete collection. That was a waste of $15.99. I’m guilty of this. My goal is to have a game worn home and road from my favorite team from each season. It’s also a goal to have the jersey of the best player on the team — which naturally costs a lot more than an average player. With the 2007-08 season right around the corner, you can bet I’ll have my eye on certain players deciding which home and road sweater I want for my collection. 3. Similarly, don’t collect just for the sake of collecting. Collecting can be addictive. When you buy a new Hummel figurine, you feel a bit euphoric. But the momentary pleasure is less than the time before, which was less than the time before that. Collect because you genuinely want an item, not out of habit. I’m past this. It used to be about the package in the mailbox for me — it was exciting. But now, it’s more about the hunt for specific shirts. I guess I am still doing it all for the “sake of collecting”, but I’m not as reckless about it as I once was. Done. When I set up my finances in Microsoft Money, I set up an entire detailed category for the hockey jersey collection. The bottom line is what stunned me into action. Oddly enough though, I can’t think of one instance where I’ve experienced buyers’ remorse. 5. Budget. If you have a collecting habit but aren’t ready to give it up, consider setting a budget. Instead of compulsively buying every piece of Princess Diana memorabilia you find on eBay, allocate $25 or $50 or $100 per month. A collecting budget is an excellent way to allow yourself to indulge a habit without breaking the bank. Done. Like I said, the new routine is one per month with a top price tag of $200. I don’t have a “rollover” plan in place if I don’t spend the $200 any given month, but over the summer, I did pick up a $500 jersey over the span of 3 months and steered clear of anything else tempting. 6. Set a limit. If you now own 20 Wedgwood pieces, you might limit your collection to 25 items at any one time. Whenever you go over this number, sell a piece to make room for the new one. I now have one bookcase for comic books — when it’s full, I’ll make room for new books by getting rid of something. Can’t do it. There have been times, I’ve looked at the entire collection and considered selling off some of it, but… I dunno, I guess I just don’t see any real benefit from downsizing right now. 7. Narrow your focus. Is there a subset of your collection that interests you most? When I cut my comics budget, I began to concentrate on newspaper comic strips. They’re more entertaining to me, anyhow. And because comic strip compilations are more obscure, the hobby is more challenging. I spend less, but I have more fun. 8. Instead of changing focus, you might collect something completely different. If your collection costs too much to maintain, switch to something less expensive. Instead of collecting old records, for example, you might pursue sheet music. Or canning jars. Or business cards. Some in the hobby have done this sort of thing — when the cost of a game worn jersey became too great, they switched to collecting game used sticks, or helmets, or gloves. None of those things really interest me and eventually, you have to think that eventually it would lead to game used jocks. Um, no thanks. 9. Buy it later. As a collector, I’m often afraid that if I refrain from buying a book, it won’t be available later when I’m better able to afford it. That’s silly. While it’s true that I might pay a little more for some books, most will actually be cheaper down the road when I have my debt eliminated. I’ve leaned this direction for the past year or so. Resale value on star players is very good — often times you can make a lot of money on your initial investment. Marginal players though, drop. So instead of buying them direct from the team or even a connected dealer the minute the player is finished wearing it, I’ve been holding off and waiting for them to hit the secondary market on eBay or craigslist — often times for far less than their original price tag. I don’t always get the player I want this way, but it still fills the holes in my quest to “complete” the collection. 10. Enjoy what you have. Take pleasure from the items you already own. When was the last time you listened to each of the albums in your CD collection? Have you looked through all your baseball cards? This used to be a problem. We solved it a couple of years ago by purchasing a heavy-duty industrial clothing rack. We set a room in the house off as the “Jersey Room” and I can hand well over 100 of them on the new rack — it has this “colorful wall of polyester” look to it and each day I’m reminded of the size of my collection. It’s been a good thing and it’s kept me from adding to my collection so rapidly. All that said, while the collection, not to mention the addiction, has certainly cost me loads of money over the years, it has had its bright spots. As I mentioned, if you select marketable players, the value rarely drops and often times increases. My collection has become a, sort of, emergency source of funds to fall back on. 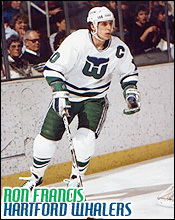 Would it hurt to sell that Ron Francis jersey? Yes, it would, but to know that I could probably get $7500 for it… well, that makes it hurt a lot less. I’ve only sold maybe 10 jerseys ever, and that was when I was generating funds for the down payment on my house. I remember vividly how my dad turned his nose up at the fact that I was blowing entire paychecks on dirty ripped shirts only to see me come up with $8k in the span of a week selling those “worthless” pieces of clothing. Slightly off topic, but I did end up re-acquiring all but one of the jerseys I sold back then, so if the owner of a 1993-94 San Jose Sharks Bob Errey road jersey is looking to sell, let me know! I’d really like to get that one back. Back in high school, I had a friend who, each Sunday, would make up a list of what she was going to do each night. Going to the mall would be Monday night’s activity. Tuesday would be to go to the driving range with Brainy. Wednesday, there was a hockey game. Thursday would be the night to go out to eat then stay in to watch her favorite tv show. Friday would be a movie. Saturday would be an all-day hike. I used to think she was nuts. Always busy. Always had something to do, somewhere to go — no downtime. None. It had to be exhausting. Then I tried it about 5 years later. It was awesome. Each day, I’d sit at work not wondering what I was going to do when I got home, instead I sat there looking forward to something I’d already planned out. Most of the time, I head out and do it straight from the office. Sadly, for reasons I’m unsure of, it only lasted a few weeks. Fast forward 10 years… These days I often find myself overwhelmed with things to do — and no “list” or scheduled agenda to adhere to. Most nights, I come home from work, eat, and veg on the couch watching the news for a few hours before getting things done. And more often than not, I never get to the projects I have in my imaginary list that’s floating around in my head. A common question that I ask my wife each day, morning actually, is “What’s for dinner?” I know she hates it. It’s like it puts pressure on her to think of something that I’ll like each day, and I can understand that considering my limited tastes. It’s like a last minute project…every day. That’s never any fun. This past Sunday, we made a list for the whole week. I know what’s for dinner tonight. I know what’s for dinner tomorrow night too. And I’m looking forward to taco night on Friday! Rewind to last week, at this hour, I’d have been sorta in limbo about what was for dinner that night. Friday, well, I can’t say I’d have even thought about what would be for dinner more than one day in the future. This new way of doing things is certainly an improvement. And financially it will be an improvement too. My wife knew exactly what to buy at the grocery store this week and we’ll end up throwing out a lot less than we usually do. Not that we threw out a ton anyway, but every now and then the ground beef goes bad, you know what I mean? That shouldn’t be a problem anymore. From here, now I just have to expand the list to include not only dinner but activities too, so I can get some of these great ideas out of my head and actually done… before I forget about them entirely. Morgan, a friend from my high school days, that I’d lost touch with, has a blog of his own with some great motivational content. I’m pretty sure we haven’t crossed paths since the day we graduated from high school. I don’t recall whether or not he attended the ten year reunion — I doubt it though as I’m sure I would have put forth an effort to catch up, if only for one evening. I remember him as being a genuine type of guy. He wasn’t the greatest student, he wasn’t a star athlete, and not to pin a negative label him, or anything, but he was far from the “everything-comes-to-me-easily, homecoming king, captain of the football team with the head cheerleader on his arm” type. But, even then, you could tell he was the type that would obviously be up for any challenge thrown his way. You had to respect that. He was going to be successful, no matter what. Of course, in high school, things like that weren’t really traits that gained you popularity. Anyway, his main theme is thinking positively and working towards success as a goal. I can’t claim to have ever been a real positive thinker, but success has always been a goal, and sometimes motivation quotes just get the juices flowing. From the looks of things, life is going great for him — and that too gets me excited to follow his lead. A friendly alliance with one or more persons who will encourage [you] to follow through with both plan and purpose. The goal, as he says, is to make these four steps habit. No matter what we do on a day-to-day basis, dealing with the humdrum of everyday life, we need to make sure that we have these four elements constantly working for us. We need to take the time to set them in motion and then help them pick up steam. This same philosophy applies, I believe, to the four steps essential for success. There has to be constant and continuous effort to make the four steps part of the every day. They don’t work if you come back to them on the occasion of a burst of energy or epiphany. They need to be part of the fabric of your every day life. Do not forget them in the din of the everyday – put them at the top of your list of daily activities. Water them and watch them grow in to the success you want. I’ve no idea who this Napolean Hill fellow is, but I couldn’t agree more.